Jérémy Tarian is a Parisian with wanderlust. He was raised close to the Jardins des Plantes before moving to the capital’s first arrondissement. After sojourns in Berlin and New York, he returned to Paris in 2012 and set up his unique and elegant eyewear brand in his home town, the city of light on the Seine. 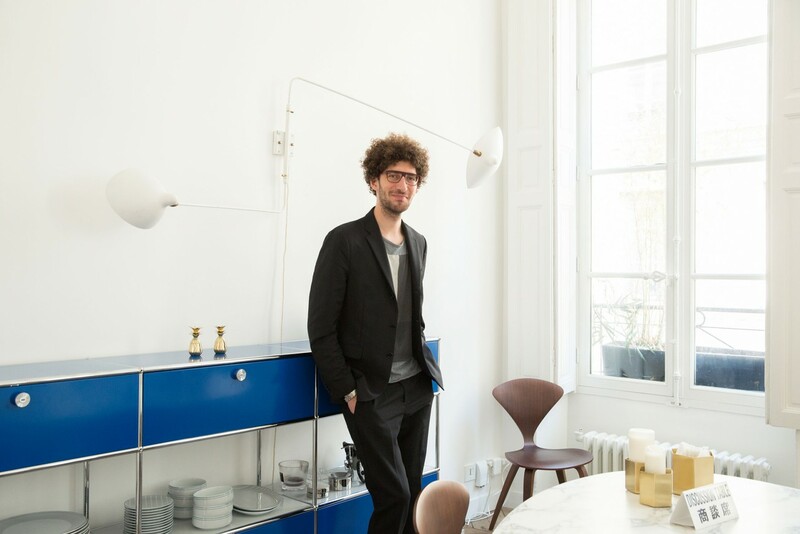 We met with the passionate lover of colors and fine materials in his brand-new apartment in the popular Château d’Eau neighborhood, and in his studio, situated in a side-street in the Marais. In the lounge, a black Studio Pool pour Petite Friture table and a signed HAY table stand in front of the Ligne Roset sofa. A resplendent yellow and white USM Haller credenza is placed against the wall, along with a lamp by Javier Mariscal for Artemide. The apartment is dotted with colorful ceramics by Tarian, made of various earth mixtures. Jérémy, you have very special ties to the Rue Dupetit-Thouars, don’t you? Yes, when I first moved back to Paris, I moved into a little studio apartment that I also used as an atelier – it was at number 12, Rue Dupetit-Thouars in the third arrondissement. As my brand became more established, I was able to find myself a proper studio in the same building. I recently moved to the tenth arrondissement. What do you like about your new neighborhood? Everything’s very mixed around here. My apartment building is very middle-class, and my neighbors have lived here forever. And yet the situation is very different just a hundred feet down the road in either direction. I love this eclectic mix and the fact that it’s a lively neighborhood. Have you already fallen into a few habits? At the moment really just eating habits (smiles). I’m originally from Armenia. The biggest Armenian food shop in all of Paris is located here, and in Rue Lamartine you can find small Moroccan restaurants, and a Syrian one just across the street…the range of choice is amazing. A hundred years ago, numerous craftspeople used to live in the courtyard that now houses your studio. Who are your neighbors now? It’s a real mix. There’s a massage institute to the left, an architect on the right, there are also two newspaper offices, an association for classical music events and even a lady who makes Japanese ceramics. I also work a lot with ceramic. How do you go on to develop your prototypes? I’ll do the first sketches by hand, and my assistant then transfers them onto the computer. We make our plates from acetate, using existing stock near Milan in Italy. These are then pressed and used ot produce small batches and unique colors. After that, we send the plates to our workshop in Jura, where the first prototypes are assembled entirely by hand. When did you establish the brand under your own name? Tarian was set up in 2012. It all happened so quickly! When I returned to Paris, I worked alongside my mother – I’d invested in her salon and it was my storehouse (laughs). Step by step, we grew and became more professional. 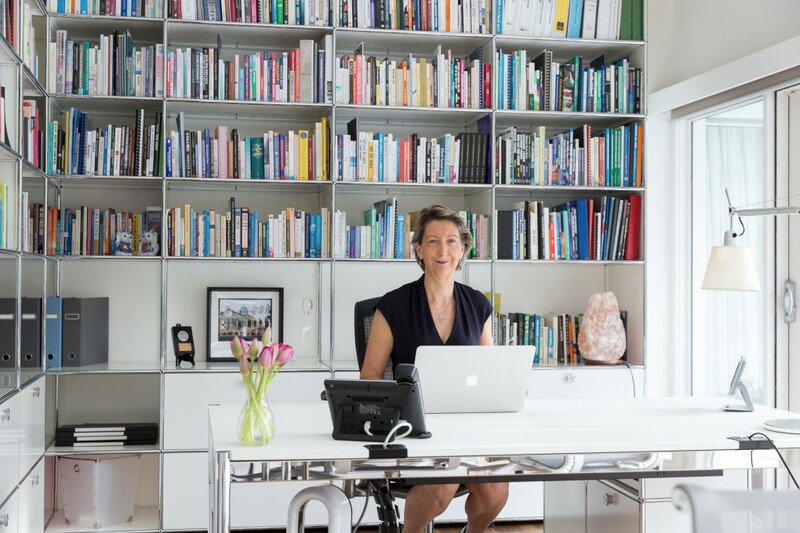 Our brand image was the most important thing for me – we strove to find something slightly offbeat, in order to be able to tell our story in clear and simple images, to find a fresh point of view and challenge people a bit. The photographer Kate Fichard has taken our pictures right from the start. How would you define Tarian in three words? Tarian’s atelier features the large USM Haller shelving, which serves as a display cabinet for numerous pairs of glasses. Your father, Alain Mikli, also had his own glasses brand. Do you get your passion for craftsmanship, your eye for detail and for high-quality materials from him? My father had his brand for thirty years. I was always around his colleagues, but we never worked together. It wasn’t a process of passing it down to me, but it did mean that I ended up working in the same field. Basically, I went to Berlin to learn German because I was studying finance: quite distant to the world of glasses! But by chance I ended up doing an internship in the accounts office of the glasses brand IC in Berlin, right on my doorstep. To be perfectly honest, the accounting side of things was not so fun, especially in German (laughs)! It lasted for two weeks, and I was gradually absorbed into the creative team. I then stayed on for two years, which was unusual. After that, I studied graphic design in New York and began to work in eyeglass shops. That suited me a lot better and I felt ready to set up my own small business. For a variety of reasons, I decided to come back to Paris, particularly because of “French craftsmanship.” It was important to me to be as close to the production site as possible. For each model, you produce 500 pairs of glasses, all numbered – you call them “limited eye-ditions.” Why do you only produce limited editions? That runs deep in the brand’s DNA. On the one hand it’s about our production – we only make glasses in small batches and use our own colors. But it’s also down to the fact that half of our collection is made exclusively out of materials that are twenty or thirty years old. There’s a factory in China that works with old acetate, which we then transform and combine with other materials, and sometimes that only results in thirty or forty pairs of glasses. The aim is to create unique and individual colors. Colors more than anything else. Even when you’re creating a glasses frame, it’s the color that determines the shape. Light is also very important: We have a lot of frames where we’ve added a transparent layer behind the colors to create a relief effect. Where does your penchant for adornment come from? Above all, it stems from the way I work. Everything around me has to be completely Zen, impeccably tidy. Perhaps that’s my Swiss side talking (he laughs). I live in a very old building, with original parquet floors, a fireplace, old shutters on the windows… On the one hand, I want to preserve these elements, but on the other, I want to add a touch of modernity, even just in the way that everything’s arranged: a half-open, half-closed kitchen without a door, to bring a real sense of circulation, an authentic and contemporary mix. Yes, that’s true (smiles). You can see the same mixture of colors here, like in the USM furniture here, which I’ve chosen in two shades. I love the idea of having horizontal stripes of color on the USM furniture fronts in the dining room: blue-gray-blue. Like a blank canvas. I love starting with a neutral foundation and adding pops of color. What do you keep in it? I have two pieces of USM furniture in my apartment, which I use to store crockery, eyewear, books and shoes. You can really use them for lots of different things. Do you also have some in your atelier? Yes, mainly a large display cabinet that I bought to meet my brand’s individual needs. It’s a cabinet that has grown with us – we’ve even taken it along to exhibitions with us. We’ve carried out a fair amount of changes over the years, extended it and added elements. All the pieces of furniture I own today are ones that I have reconfigured and adapted to my needs. How did you first hear about the brand? I attend two workshops a year at HEAD (Haute Ecole d’Art et de Design [University of Art and Design]) in Geneva, which – like many universities in Switzerland – is very well equipped with USM pieces! From my very first workshops, I was surrounded by this furniture and it really caught my eye. Then I found out that it’s also available in Paris. I first went into a store in 2012, and it was a revelation. A short time ago, I founded the cooperation Tarian+. For the first edition, students at HEAD created a frame from start to finish. The idea is that I come along with a plate of acetate, and they transform it into a pair of glasses completely by hand. We even go a step further and ask them to put forward images for the campaign. We have high expectations for the results. We would like to express our gratitude to Jérémy Tarian for welcoming us into his beautiful, light-filled apartment and into his inspirational atelier. A big thank-you for his hospitality, his high spirits and his infectious good mood.